My DB and I have just come back from over a week away. Du jamais vu! Yes, from Wednesday to Saturday ten days or so later we were over the hills and far away in (Corsica and) Sardinia. It was a marvellous break because Sardinia is so beautiful with such varied scenery, and it was amazing to have a so much time away together. We went on the motorbike of course - Sardinia is a biker's heaven, with great roads in good condition and not too much traffic especially out of season. I packed my capsule wardrobe into my faithful little blue and green bag that my parents left after one of their visits many years ago, and is the exact size of the BMW side case. I'm getting good at it, but didn't know whether the evenings would be warm enough for a little top. They weren't, so I took two tops too many, a pair of black trousers too many, and over-packed a black jacket which I wear with the little tops and black trousers. But apart from that, I wore everything! We rode to Marseille port, got on the overnight Corsica ferry and had a delicious dinner from a buffet starter, then really good pizza, and wine. There was also a menu for just buffet starter and buffet dessert which, with hindsight would have been better as the starters were so tasty, and I was looking forward to having on the boat going back. Just my luck that it was a different boat and company, and we had to use the motorway service station-style caff. Disappointing! The ferry deposited us at Isle Rousse (top left), so called because of the brilliant orange colour of the rocks, and we rode off in search of breakfast as it was only 7am. I was also looking for a bar with wifi as my son had badgered me just before we left (literally, like 5 mins before!) about some shoes he'd received from Brandalley, didn't like, and wanted me to buy some more. I was so not in the frame of mind for buying shoes on the internet, so told him to send me a link to the ones he liked. He suggested I give him my credit card details and website login so he could do it himself. Nice try, son. So it was that I was sat in Calvi, at a bar overlooking the lovely little port with my café crème and croissants battling with Brandalley. I made the transaction and didn't notice the delivery date. When I did, several hours later at the hotel, I realised summer would be practically over before the shoes arrived and had to call to cancel the order. The things one does on holiday! We took the tourist coastal road south. It was full of pot holes, repaired pot holes, newly forming pot holes, and pot holes upon pot holes reproducing like rabbits. The weather was a bit hazy but not actually raining. We stopped for lunch at Porto, bought some last minute just before it closed at midday supermarket sarnies and crisps and sat on the pebbly beach to eat. The pebbles were many and varied in colour and degree of speckling. Wet, they were a riot of colour. So we had the port to our right, a look-out tower set up on a jutting rock just in front of it, the lovely blue sea before us, and some impressive sheer cliffs to our left. They had many a ring and other device for fixing climbers' ropes up the impossible-looking rock face. Rock climber's rock face. Click to see hooks and rings. The pink granite rocks at the water's edge had been weathered into fantastic blobby shapes, as though a giant child had thrown down dollops of melting marshmallows and they'd set solid. Porto rocks like marshmallows or rhinoceros hide. Ajaccio came and went, and we stopped a few kilometres south at Porticcio, just off Agosta Plage at the Kalliste Hotel. Our room was an apartment kitted out from Ikea, with views towards the sea. It's practically brand new and a little bijoux. We had to dine out though as there's no restaurant. The receptionist recommended the Auberge de la Ferme just down the road. We walked there, got lost, had to call for directions and found it behind the Radisson at the end of a side road full of building materials and up a hill. We were a tad ratty by the time we arrived. Still it was worth it, for the best veal daube EVER. It was tasty, tender, not full of smoked bacon or too olivey (like daubes often are), but just a perfect harmony of taste and texture. Pure bliss. It felt good to be on holiday. Getting that wanderlust again, after reading this. Oh Costa Rican roads are like that too? To be fair, the main roads we went on were not like that at all, thank goodness! O that looks like a wonderful place to vacation. Sadly, I don't know how to operate a motorbike. Honestly, I'm scared to death of them. Nothing to protect oneself if hit by a car. Your darling son must think you're a complete idiot, if he thought you were going to give him your credit card number and allow him to do the shopping himself. Corsica is totally packed out in the summer with visitors. We were a little early because the best time is in June apparently. We got all the spring flowers though and early greenery so it all looked wonderful and fresh. Have been looking forward to reading about your trip. Only been once to Corsica - an afternoon in Ajaccio when we had our Mediterranean cruise. Love the rock formations in the photos and laughing at the Internet shopping!! On Christmas Day the only place to eat open was a pizza van, and we were unwelcome in another restaurant that seemed to be the HQ for Corsican independence members because they wanted us out ASAP and gave us mouldy tomatoes by way of encouragement. That porche line-up is hilarious!!! Only on a rocky lonely beach in Europe would you find that! We went to Sardinia but were considering Corsica and now I really wish I'd been there too, the light and the blue of the sea is like no other. I have never ever heard of daubes, now going to google it! Super photos, Sarah, especially the geology. :-) I'm not a biker, but doubt I would want to drive down that road in a car, let alone on a bike. But I would have loved the daube! I know! Terrible, isn't it?! We went on a boat trip and another biker couple were complaining about it to another couple. They were Harley bikers with much lower bikes so that must have been difficult. What a cool holiday! 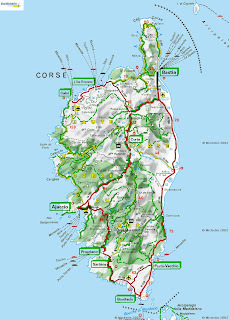 I'm promising myself that I'll finally make it to Corsica this year. Sounds a plan, best not to go in July/August though unless you like crowds of tourists! The best way to visit Corsica is with motorbike. Enjoy smells , landscapes, and fell free ! Visit us at www.corsicarentalbike.com .